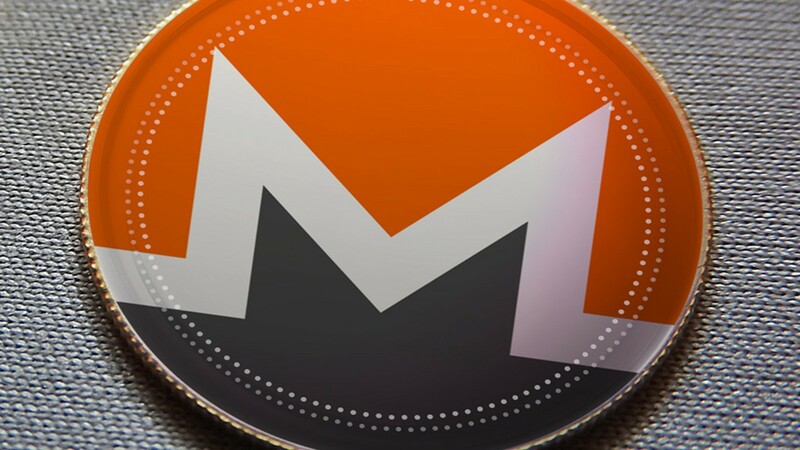 Monero is an open-source cryptocurrency created in April 2014 that focuses on fungibility, privacy, and decentralization. Monero uses an obfuscated public ledger, meaning anybody can broadcast or send transactions, but no outside observer can tell the source, amount or destination. 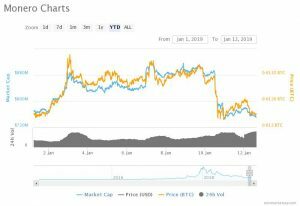 The 14th largest cryptocurrency – Monero with its current market cap stands at the level of $750,625,722 (09:32 UTC) on January 12 dropped in current value by 60% relative to the level of November 06 as analyzed from the graph above. Let us not forget that he the strong bearish pressure from around the world that caused a drop in value corresponding to November 06 which can be visible from the analytics above. However, the XMR/USD pair remained ‘uptrend’ on December 19-24, and again on January 05-09 December as interpreted from the graph above which signifies the bullish trend. The XMR/USD pair gained in value dramatically by 15.9% compared to December 14 which can well be analyzed from the graph above, which signifies that the bullish trend may expect to accelerate soon! Since both moving averages are declining continuously until December 19 by creating the downward pressure over the value as interpreted through the line in the graph above, the XMR shows that the bears have the upper hands as the XMR/USD pair remains in bearish trends for some time until the next “uptrend” takes place. There are no bullish patterns that suggest a buy as of today. Hence, it is best to remain on the sidelines. With this, traders that long awaited to trade with this currency may explore to create the long position to the extent that the ‘uptrend’ takes place. Now let me walk you through certain milestone that this cryptocurrency attained in the recent past. The XMR/USD pair remained range bound from October 11 to November 03 last year, as the cryptocurrency rallied from a low of $101 to a high of $114 which is a 12.8 percent minimal return within 24 days. Let us not forget that Monero is cash for a connected world, and a fast, private, and secure. With Monero, you are your bank that’s how this altoin acts. You can spend and trade safely, knowing that others cannot see your balances or track your activity. Monero is a decentralized cryptocurrency and secured digital cash operated by a network of users. With this, transactions are confirmed by distributed consensus and then immutably recorded on the blockchain. The other benefit is that the third-parties do not need to be trusted to keep your Monero safe. Monero uses ring signatures, private ring transactions, and stealth addresses to obfuscate the origins, amounts, and destinations of all transactions. Monero provides all the benefits of a decentralized cryptocurrency, without any of the typical privacy concessions. While sending and receiving addresses as well as transacted amounts are obfuscated by default. Transactions executed on the Monero blockchain cannot be linked to a particular user or real-world identity! As we can quickly analyze from the graph above that the MCap stands at $750,625,722 (09:32 UTC) with the blue trend line, and Price (BTC) 0.01230555 through orange trend line with 24h Volume 25,734,620 USD (09:34 UTC) can be interpreted from the graph above. The price traded at the all-time highest on January 07 with Price/BTC traced above the MCap which signifies the bullish trend as traders and investors are more inclined to invest in this currency. However, both the pair, Price and MCap started downward trading moments from January 10 which can be interpreted from the analytics above. While we can estimate from the first graph, if bulls succeed in rising and sustaining above the current resistance level $44.89 (09:29 UTC) and create “uptrend” in value (i.e., traded above the EMA) the investors will start buying this currency more and more thereby increasing its value. However, based on the current trend, the next support level could be $45.5. Please feel free to visit https://ww.getmonero.org/ to know more about this cryptocurrency!